The Secret Trails of the Island of Corsica. Wonderful scenery, highlighting the contrast between coastline and mountainous regions. Great insight into one of the least known parts of Europe. Good local food and wines, magnificent views. 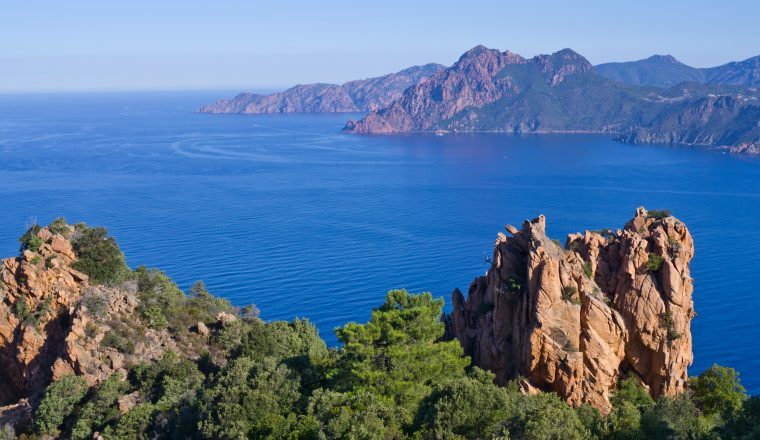 Corsica – the birthplace of Napoleon and (so the locals claim) of Christopher Columbus – is a Mediterranean island the culture of which owes as much to Italy as to France. But in truth Corsicans, who have long had a difficult relationship with France, believe themselves to be unique. The result is a distinctive culture on a rugged, wild island surrounded by a magnificent coastline with fine beaches, offering some of the most varying landscapes in Europe. 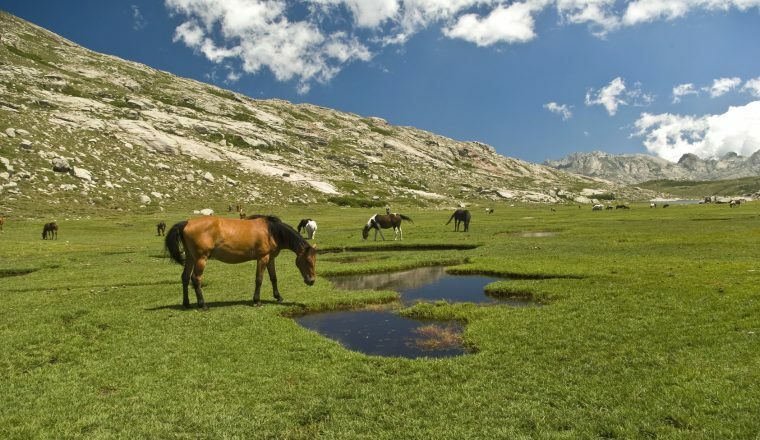 The climate is benign and the island is not spoilt by tourism.The walking takes you through the central part of Corsica and finishes on the west coast. 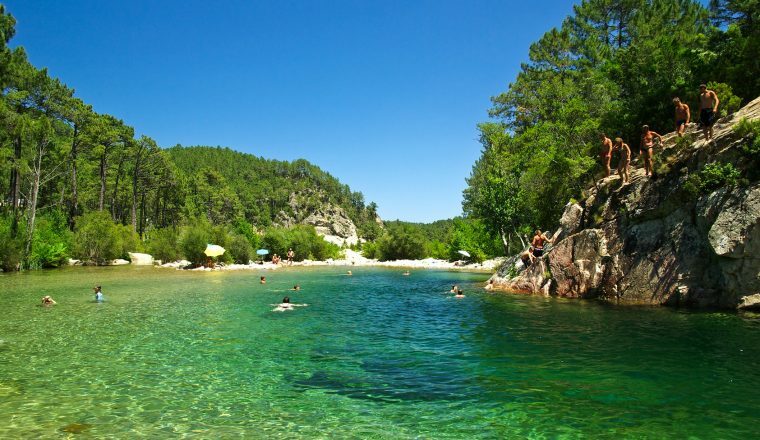 It is a stunningly beautiful area, filled with Mediterranean flora – in Spring, for example the rose coloured cistus flowers and the white blaze of Asphodels cover the hills. The warm sun on the maquis brings the invigorating smell of wild myrtle, thyme and rosemary. There are wonderful views across the sea and towards the mountains. There are gorges and rock pools. An unforgettable destination. £799.00 per person (supplement of £70 per person in July, August, and September). Single supplement: £260. (Single supplement July/August £325). Supplement for starting on day other than Sunday £30 per person (no supplement for 4 or more people). 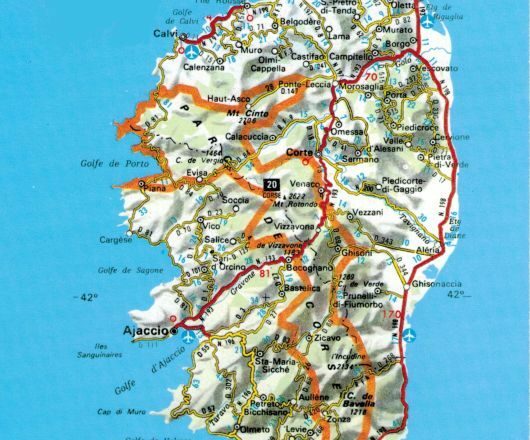 7 nights accommodation in rooms with private bathroom, 7 breakfasts, 5 dinners, transportation as necessary within the programme (except transfer by public bus to Ajaccio on day 7), luggage transfers (except day 7), route instructions and maps, emergency back-up. Meals except those mentioned above, drinks and incidental expenses, bus and luggage transfer to Ajaccio on day 7, flights, and transport to/from airports. Day 1: Arrival Ajaccio for overnight. A vibrant city, there is much to enjoy, from cafes and restaurants to museums, the cathedral and Napoleon’s house.There is a choice of good walks to be done along Les Cretes, the ridge overlooking the city, from where there are wonderful views to the mountains and across the gulf. 6 to 11 kms walking, 2 to 4 hours. Altitude gain: from +140m to +340m, altitude loss -140mto -340m. Overnight Ajaccio with breakfast. Day 2: Ajaccio to Calacuccia. An early morning transfer by train or vehicle to the Scala di Santa Regina, just outside Corte. A historically important trail, it was used by shepherds leading their herds in and out of the Niolu Valley, and winds among granite cliffs and a ‘balcony’ path to the Erco Genoese bridge. Descend to Calacuccia village, passing through old chestnut groves. 10kms. 4 hours. +705m -345m. Overnight with dinner and breakfast Calacuccia. After breakfast we transfer the short distance to the maison forestiere in the vast Corsican pine tree forest of the Val du Niellu. Walk through the forest, emerging at the famous ‘Col de Vergio’, the high mountain pass marked by a towering statue of Jesus. This is the division between the north and South of Corsica. From here we have fantastic views of the lake and Niolu which we have just left. We walk downhill along old forest tracks and paths through the maquis, into chestnut forests and Evisa village. Day 4: Evisa circular walk. The village of Evisa is 830m high and our walk today is a village to village walk following an old route though the maquis. We walk to the abandoned hamlet of Tassu and then onto Marignana situated across the valley from Evisa. We then walk via the village of Cristinacce on our way back. This walk gives one a good insight into rural village life in Corsica today. Our walk today takes us through the Spelunca Gorge getting closer to the rose coloured granite sea cliffs as we walk. We follow the torrent to a Genoese bridge and from here we start the walk up through the maquis towards the village of Ota – a village that combines mountain architecture with a hot Mediterrean climate and flora. Braying donkeys, hunting dogs and villagers working in their garden, bougainvillaea, lemon and fig trees all add to the colour and beauty of the village. Then downhill and again we will notice different vegetation and plants associated with heat and granite in abundance – deep blue black island lavender, pale pink and white cistus that smells of witch hazel. Porto is a delightful sea town with plenty of options for water sports and swimming. A half day walk leaves you plenty of time to explore Porto and perhaps enjoy a boat trip or go snorkling or scuba diving. Then walk across the beach with fine views of the gulf and up through the maquis, with views of the spectacular coastline. Lots of wild flowers and once in the ‘calanques’ you are surrounded by scupted rocks dotted with maritime pine trees. Reach Piana with its own small cove. Transfer by public bus with your luggage (pay driver directly). Overnight hotel in Ajaccio with breakfast.It is possible to stay two nights in Piana and omit the last night in Ajaccio. 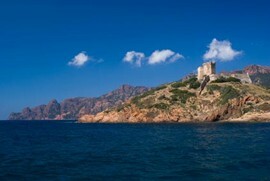 However a private transfer is needed on the Sunday as public buses do not run on a Sunday from Piana to Ajaccio. Please ask for the cost of the transfer if you wish to do this. 7 breakfasts, 5 dinners, transportation as necessary within the programme (except transfer by public bus to Ajaccio on day 7), luggage transfers (except day 7), route instructions and maps, emergency back-up. By air to Ajaccio airport. There are also numerous flights to Bastia airport further North. Private transfers are available from Bastia to Ajaccio. 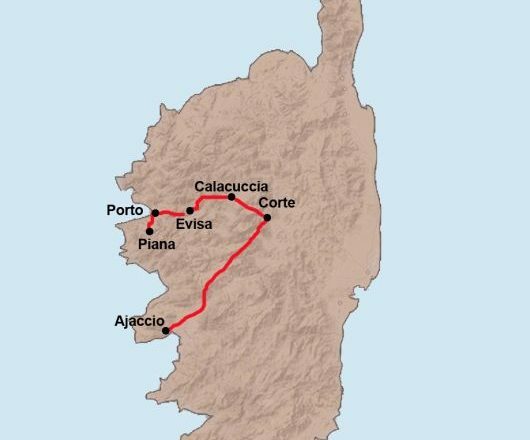 There is also the option to take a scenic local train from Bastia to Ajaccio (between 4 and 5 hours) which costs approx. 35 Euros per person.